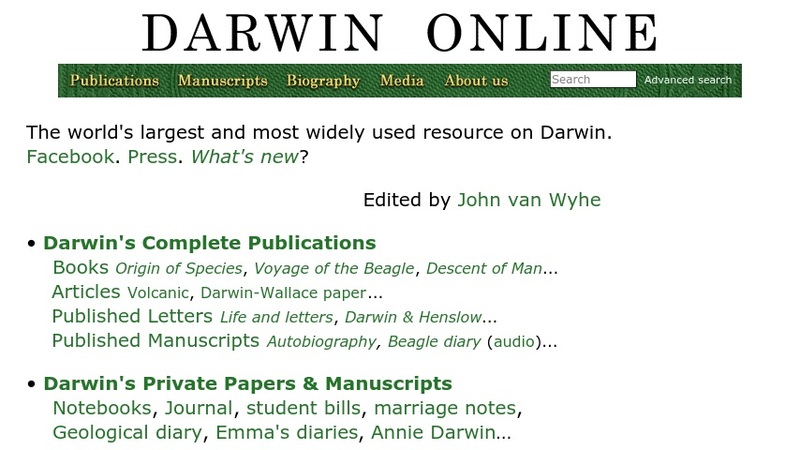 This archive features all the known work of Charles Darwin, including his publications, private papers, supplementary works, and specimen descriptions. It contains first editions of "Voyage of the Beagle," "Zoology," and "Descent of Man;" all editions of "Origin of Species;" his diary, notebooks, and journal from the "Beagle" voyage; and his autobiography. There is also a bibliography, reviews of his publications, biographies, and obituaries. The archive includes digitized texts, covers and illustrations, as well as downloadable audio files of some works. It is searchable by keyword, name, date, title, document type, language, and several other parameters.